We got a ride back to the trail outside the Bear Mountain zoo area again from the owner of the motel around 8:45am. It was nice to get some iced coffee, bagels, and donuts in town first though. 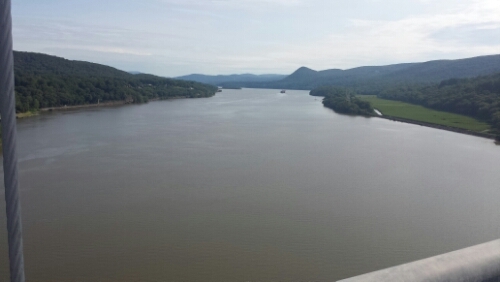 After the zoo, the trail crosses the Hudson on the Bear Mountain Bridge. Roughly 5 miles into the day, the trail goes right past this gem. We hung out with some other thru-hikers at the picnic tables and rocked some Italian Ice. 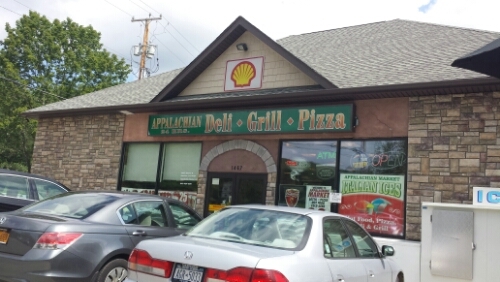 This place had loads of food and it was a shame we only had done 5 miles out of town when we hit it. If we had hit that after a few days out of town, we’d still be there eating pizza, sandwiches, ice cream, pasta… Well, you get the picture. Most of the hiking was pretty uneventful. 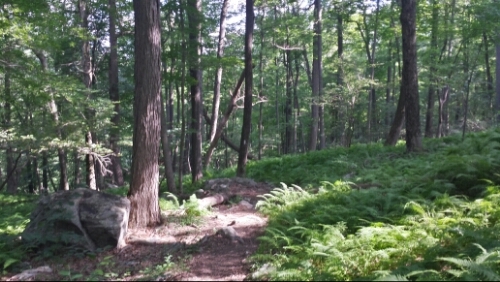 The difficulty level was average, with some short and steep elevation changes, which seems pretty typical for New York. We ended up in the state park around evening. I promptly got stung by a bee that was hanging out in some brush by the trail, so that was annoying. We are supposed to camp here in some designated campground down by the lake, but we decided due to tiredness to just stealth camp in the woods off the trail behind a big rock formation. We had earlier plans of going down and using the campground showers and such, but that may not happen either due to tiredness. Also, one day of stank out of town isn’t too bad (I think). Tomorrow we continue trekking through NY. I expect a fairly similar day, with some food near road crossings and probably pretty much the same terrain and sights. It is the AT though, so you never know. Song stuck in my head – All of Life Is Peachy by Korn. There aren’t many metal bands from the 90’s that my 34 year old self will still admit to listening to (I finally threw away all my Limp Bizkit albums, weee! ), but this album is still awesome IMO. This entry was posted in updates on July 20, 2014 by Joel. Yet another milestone. Congratulations again!!! The bee thing…that makes me think about you being back in the atrium at Lutron! 🙁 Your posts, however, are still awesome. Thank you for taking us along on your adventure while you do all the work! 🙂 Sending you bee-off thoughts, more and more prayers and lots and lots of love. I take it that you didn’t have any kind of a reaction to the bee sting. That’s a good thing. 1400 plus miles on foot boggles my mind! Again, thanks for sharing your experiences with us.